What New Ways Will iPad Users Find to Hurt Themselves? Apple Tablet in the Works: More Like a Mac Than an iPhone? "If there has been an editorial theme about the iPad over the last few days, it's been this: it disappoints . . . (Can you say 'Un-Ives-like Bezel' three times fast? ), by the missing features (no camera, no multitasking, still no Flash), and so forth. And yet, despite these seeming flaws, I'm wildly enthusiastic about the tablet. I think part of that enthusiasm is attributable to the fact that I'm a dyed-in-the-wool netbook user . . . and we are the actual target audience for the device." "And not everyone needs a PC . . . a massively overpowered piece of kit for the average consumer . . . Nearly everything we geeks love and adore about a general-purpose computer is a pain point for the average consumer...."
The Atlantic Monthly's John Hudson says the iPad is supposed to succeed where smart phones and laptops have failed in offering a light, comfortable-to-hold viewing screen with a variety of functions, observing that most iPad use will consist of consuming content and surfing the Web. Hudson says the single biggest benefit of the iPad is speed, feeling at least a generation faster than the iPhone 3GS, also noting that the biggest surprise is the lowball price of the entry-level unit. Link: Apple Unveils the iPad: A Laptop Competitor? "If you always wait for the next price cut or to buy the new improved model, you'll never buy any technology product because there is always something better and less expensive on the horizon. The good news is that if you buy products from companies that support them well, like Apple tries to do, you will receive years of useful and satisfying service from them even as newer models are introduced." PCMag's Michael J. Miller says that while it's probably inevitable that after a product gets as much pre-announcement hype as the iPad has, it's only a day or two later that you start reading about what the product doesn't have and why it therefore must fail, observing that no one knows yet whether the iPad will succeed, but that many of the reasons people give for its inevitable failure don't hold water as reasons that people won't buy it. Digital Arts Magazine's Neil Bennett and Matt Egan address the question: What does the new iPad mean for artists? They suggest that it could be pretty meaningful as a digital sketchpad, with its 1024 x 768 pixel display at 132 pixels per inch, although it's unlikely to have a professional level of touch sensitivity. Other graphics used cited: a portable portfolio; a new lease of life for design of newspaper, magazine, or book layouts; and hope that the iPad will enable more creative use of interactivity and create more work for interactive designers. "Since iPhone, iPod touch and iPad uses the same OS (iPhone OS), the look and feel is generally the same throughout the three iDevices except for the few tweaks here and there in the iPhone OS 3.2 running on the iPad. "Now if you want to make your iPhone and iPod touch to look exactly like the iPad, simply follow the steps as shown in the video below to get the same lockscreen and springboard background, carrier logo which reads 'iPad', an iBooks like app, New York Times reader, the entire Kindle books catalog and much more...."
"Orthopedic doctors are increasingly seeing injuries from people using smartphones, mainly from people slumping over to use the devices. "Smart phones and laptops, handheld video games and MP3 players, and now, perhaps, Apple's new iPad - the latest technology is great, but it is also a literal pain in the neck, doctors say...."
Link: What New Ways Will iPad Users Find to Hurt Themselves? Abilene Christian University's student-run media staff announces its commitment to produce the first paper of its kind for Apple's iPad. Dr. Cheryl Bacon, chair of ACU's Department of Journalism and Mass Communication, says students and faculty already are working to achieve this goal. "This is yet another opportunity for our students to make use of a cutting-edge delivery system - the third version of mobile media delivery we have pioneered," Bacon says. She cites her department's track record: dissemination of The Optimist student newspaper via iPhone in the fall of 2007; adoption of an updated application in the fall of 2008; and now, ACU's preparation for delivery of The Optimist on the iPad this spring. ACU's nationally recognized and accredited JMC department already has taken the first steps to establish an iPad Task Force. Its goal: to use dedicated faculty and student leaders from across campus to develop The Optimist's new digital publication platform. They will do so in the department's converged media newsroom, one of the only student newsrooms of its kind. "We pay close attention to the way young people consume news," says ACU's Kenneth Pybus, faculty adviser of The Optimist. "They tend to use all the tools at their disposal to get information. With the iPad, we foresee the potential for an explosion in news consumption." Professors Pybus and Bacon believe the iPad and its publishing platform will yield a marriage of audio, video and text unseen even since the advent of laptops and smart phones. George Saltsman is executive director of ACU's Adams Center for Teaching and Learning. "The work we will do leading up to the formal debut of the iPad is an outgrowth of research that's been happening on our campus for three years," says Saltsman. "Our campus community is already riding the next wave of digital communication. Publishing The Optimist on the iPad means our students will be ready to work with this revolutionary technology in the marketplace the minute they graduate. For some of our students, that day is right around the corner - so of course they'll have a major jump on not only their peers, but also on veteran software developers nationwide." The aspect of this software development drive that most fascinates Bacon is how it could revive the publishing sector as a whole, and newspaper publishing specifically. "The news business must find a way to keep news delivery profitable. Remaking the model for news delivery is the single most important discussion in journalism under way today," she says. If our students and faculty, by being in the middle of that discussion, can help devise a profitable new delivery system, we will have accomplished something extraordinary. PR: As Steve Jobs and Apple prepared to announce their new tablet device, activists opposed to Digital Restrictions Management (DRM) from the group Defective by Design were on hand to draw the media's attention to the increasing restrictions that Apple is placing on general purpose computers. The group set up "Apple Restriction Zones" along the approaches to the Yerba Buena Center for the Arts in San Francisco, informing journalists of the rights they would have to give up to Apple before proceeding inside. Other critics of DRM have asserted that Apple is not responsible, and it is the publishers insisting on the restrictions. However, on the iPhone and its new tablet, Apple does not provide publishers any way to opt out of the restrictions - even free software and free culture authors who want to give legal permission for users to share their works. Tech Crunch's MG Siegler says now that we've all seen the iPad and know just about everything about it that we possibly can, Apple may actually be hard at work on a second device, hastening to emphasize that this is a pure rumor that you should take with a grain of salt. Siegler says that although this rumor originated from a good source, it was a secondhand source, who said this tablet device would be bigger and much more like a Mac than an iPhone, with a screen maybe as big as the 15.4" one currently used in the middle MacBook Pro and running Mac OS X 10.7 instead of the iPhone OS - and to be released within the next year. If there is any substance to this speculation, it would certainly make tablet computing a lot more attractive to those of us who do serious work on our Macs. PR: iPhone and iPod touch owners: If you haven't had the chance to check it out, go to the iTunes App Store and download our cool new Touch Mouse app. It turns your iPhone or iPod touch into a wireless trackpad and keyboard for your computer, so you can point, click, scroll and type from afar, in any application, on a Mac or PC. And the best part is, the app is free! Download Touch Mouse Server software and install it on your computer. 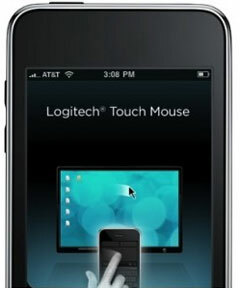 You'll find instructions when you download the Touch Mouse Server software on Logitech.com. Give it a "scroll" and let us know what you think! PR: Atlanta-based independent developer Vais Salikhov announces Find In Page 1.0, their new search utility for iPhone and iPod touch. Find In Page adds in-page search capability to Mobile Safari in the form of a bookmarklet. Once installed, accessing in-page search functionality is only 2 taps away. With the ability to search text, especially in long webpages, is critical to mastery of online content. Now this vital productivity tool is available to iPhone users. Install and use one of the third-party Web browsers available on the App Store - replacing Safari entirely. Use one of the less-than-stellar "bookmarklets" circa 2007 that feature no user interface for navigation among search results and suffer from a number of technical, as well as general usability issues. Unsatisfied with these options and tired of waiting for Apple to add in-page search to mobile Safari, the developer of Find In Page simply created his own app to deliver this missing feature to iPhone and iPod touch users via the App Store. Find In Page app delivers its functionality in the form of a "bookmarklet" - the only way new features can be added directly to the mobile Safari browser. Once installed, accessing in-page search functionality is exactly 2 taps - same as the two clicks required for "Edit - Find" in traditional browsers. In-page search is one of the most important productivity tools for doing serious research on the Web, as well as simply getting oriented in larger webpages. It significantly reduces the amount of time required to review search engine results: instead of scanning and reading each page for relevance, you can use in-page search to look for relevant keywords, saving time and frustration. Ability to search text, especially in long webpages is critical to mastery of online content. Now this vital productivity tool is available to iPhone users. Find In Page 1.0 is 99¢ and available worldwide exclusively through the App Store. PR: From one of the top award-winning software developers for the Mac comes an iPhone application that offers an exceptional user experience that is both fun and useful. Memos for iPhone transports you into a world where ideas take shape and follow the touch of your fingers to organize themselves just as you imagine them in your mind. Create notes and memos on the go with your iPhone and move the icons with the magic of multitouch - five fingers at a time if you dare! The application incorporates professional photography and graphics to create a gallery of images so that users can easily express a range of ideas. Another cool option allows you to change the wallpapers of the iPhone with a shake, which will really amaze your friends. Apimac Memos for iPhone is the perfect application to quickly jot down notes and email them to colleagues, family or friends. The archive function allows you to store notes that you want to keep. Attention to Apimac Idea users: Apimac Memos is the new name of Apimac Idea; all users can upgrade from Apimac Idea to Memos for free. PR: Texas-based Pocket Watch Software has announced iPad support for ActivePrint 7.0. One of the best features is that virtually all iPhone and iPod touch apps are compatible with the iPad. This means that you can already print from the iPad using the current version of ActivePrint for the iPhone. With ActivePrint, you can print to any printer that your PC can print to over your WiFi network - or over the Internet using your iPhone's EDGE or 3G network. There are several features that are going to be made available to app developers that we will be adding to ActivePrint. Among these new features is the ability to print common office documents including word processor documents, spreadsheets, and presentations! And you will still be able to easily print photos, contacts, plain text, and web pages to any printer that you can connect to a Windows PC! It doesn't matter what printer you have. Print while you're on the go with ActivePrint on your new Apple iPad! ActivePrint 7.0 is $3.99 and is available worldwide exclusively through the App Store in the Productivity category. PR: M.O.C. Interior Designer, LLC announces Home Interior Layout Designer - Mark On Call 2.1 for the iPhone and iPod touch, updating their incredibly popular interior design app. Now users can publish and store their room designs on the Web and owners of the app may peruse the new "Rooms Gallery", an assembled area for all users' published rooms. From directly inside the app, users can import, customize, and apply the room designs of others to their own personal space. This gallery also lets users backup rooms, move rooms to another floor plan, create room templates, and "trade" or collaborate with other designers, clients, friends, family, or Mark On Call users. Additionally, users may discover fabrics or finishes on someone else's furnishings in a published room, import that room, and automatically collect and apply these newfound custom color presets. A custom color preset is created when a user takes a picture using the iPhone's camera (or uses images from their photo library) of an actual finish, fabric, rug, paint color, wallpaper pattern, or flooring material and "skins" or renders them onto an item or surface in their virtual room utilizing the Mark On Call application. 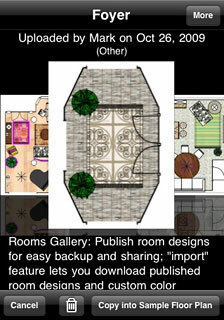 The "Rooms Gallery" features a Cover Flow interface and can filter results by "Just My Rooms" or by room type. Published rooms can be deleted only by the original creator. The application works in both the English and Metric measurement systems. The Units Settings has been moved from the device's general Settings app to the Mark On Call main menu "Design" section. Options include "feet and inches", "inches only", "meters and centimeters" or "centimeters only". Walls are always displayed in feet and inches (or meters and centimeters). The Room Editor, where rooms can be accurately drawn and measured to scale, offers nine room shape templates, customizable with a "touch and drag" system. Not only can walls be moved, but corners can be added (or deleted) and repositioned to create precise angles. To assist with architectural accuracy, walls turn green at 0°, 30°, 45°, 60°, and 90° and display the degree number next to the wall measurement. A customizable background option that can be used to represent wall paint or a wallpaper pattern has also been added, and functions the same as rendering a room item or floor surface. Users may coordinate rugs, flooring and other room items to their walls in this virtual space before actualizing their design plans. Based on Mark Lewison's home decorating book, "What Would You Do With This Room? My 10 Foolproof Commandments to Great Interior Design", Mark On Call is truly home design in the "palm of your hand". Users can access and customize over 160 furniture and architectural elements, choose from a palette of preset color, fabric and finish options, take advantage of the easy-to-use color wheel, add snapshots of floor models corresponding to items in their room designs, create and share detailed shopping lists, and send images of their room creations via in app email. Mark On Call is an excellent tool for interior designers to help them conceptualize, design, store and shop for clients, or anyone planning their fantasy or actual living space. Home Interior Layout Designer - Mark On Call™ 2.1 is priced at $2.99 and is available exclusively from Apple's App Store and works on the iPhone and iPod touch. Minimum system requirement: iPhone OS 3.0. Please note: Mark On Call Rooms Gallery feature requires a network connection. PR: Pressmart to bring content from publishers in fifty countries to the iPad. As soon as consumers lay their hands on Apple's game-changing iPad , they are going to be hungry for content. And the news industry is itching to fulfill this hunger while it waits for its own iPod moment that changed the music industry forever. Pressmart, a leading print-to-online content publishing service, announced its support for the Apple iPad. Publishers from over 50 countries use Pressmart service to deliver content to their subscribers in Same-as-Print Online Editions, Web 2.0 Interactive Community-Ready Websites, Custom-Branded Mobile Apps and eReaders. Pressmart already supports all major eReader devices like Kindle, Sony, Nook and Cool-er. With the iPad's larger screen, the mobile consumption of news and general content through websites and Apps is expected to surge heavily. iPad is made primarily for content consumption and Publishers do not want to lose out on this opportunity. Publishers who do not have a rich, community-driven website or a Mobile App can now use Pressmart to create one, and as a hosted, on demand offering, said Sanjiv Gupta, Founder and CEO of Pressmart. Pressmart is a digital conversion and delivery partner of print publishers including newspapers, magazines, catalogs and books. It has a global customer footprint in 49 countries with 700 publishing titles in 24 languages delivered to 1.5+ million subscribers worldwide. Topline Publishers like Philadelphia Inquirer, San Diego Union Tribune, Orlando Sentinel, Trinity Mirror UK, WallStreet Journal Asia are some of its customers. Pressmart's Channel Partners include Cadmus - a Cenveo group company (Printer, US), Curtis - a Hachette/Lagardre group company (Distributor, US), Higgs - a DHL group company (Distributor, UK), Geon (Publisher/Printer, Australia). It is VC invested by DFJ and NEA-Indo US. Its operations are based in India with Sales and Partner relation presence in US and UK. It has an experienced management team backed by a strong Engineering expertise. 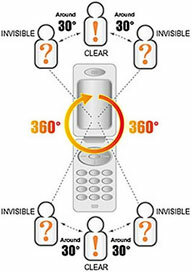 PR: Ever wonder how to keep prying eyes away, then check out the Apple iPhone 3G Privacy Screen Protector. Its got everything you need to keep your portable device in-style and at the same time, it screens your phone from random people from checking out whatever it is you are doing. So rest at ease knowing that the next time you're looking at stocks, Facebook, emails, and bank accounts that no one is minding your business! This privacy film can protect your privacy by having one 120° (60° in the upper, 60° in the bottom side) visible and rule out the other people in the rest of 240°. Customised to protect iPhone, no need for any cuttings and resizings. Note: It will be a little bit thicker than other normal screen protectors. You should pay attention if you are using some cases that is very fit/tight. 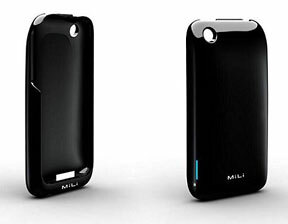 PR: The MiLi Power Skin Battery Case, is a new battery charger case that works with the iPhone 3G and iPhone 3GS, and according to the manufacturers it is the 'worlds thinnest iPhone case with battery charger'. The case is pretty thin, measuring just 18mm at its thickest point, and it is definitely one of the thinnest in the world for similar type of products. When you place your iPhone 3G/3GS in the case you notice just how thin it is compared to other models available. The case is comes in two parts which clip together to protect your iPhone 3G/3GS, as you can see in the photo in the product page, it is very easy to use, just slide your iPhone into the case and then put the top part of the case on. The case is made from a hard shell plastic, and it features a sleek black paint finish, similar to the back of the iPhone. On the bottom of the case there is a microUSB port that is used to charge the case via USB, and on the side there is an on off button, and a battery indictaor with built in LEDs which shows you how much charge is left. Nearly double your battery life - 1200 mAh stored inside. Protection to your iPhone from knocks and scratches with its hard shell case. PR: Are you a race car enthusiast dreaming of one day owning everything in carbon fiber? Are you looking for a iPhone case to stand out in the crowd of boring and flimsy plastic accessories? 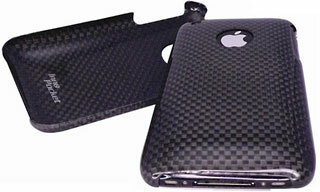 InnoPocket presents a genuine carbon fiber case for iPhone 3GS/3G that looks awesome to you. Not only is this a supreme quality product, but it definitely attracts attention from all direction to you. This is a must have product for any car enthusiast or carbon fiber lover. Protects iPhone from light bumps and scratches. All iPhone ports and buttons remain open and accessible, so there is no need to remove this twine (Carbon look) once it has been attached. PR: Zagg Inc., producer the popular InvisibleShield™ and Zaggaudio™ brands, has begun accepting InvisibleShield preorders for the Apple iPad. Announced by Apple CEO Steve Jobs at an invitation-only conference, the iPad is a highly anticipated touch screen tablet computer. Zagg will continue accepting preorders through the official launch date of the iPad. The InvisibleShield is Zagg's military-grade, virtually invisible, and indestructible film that protects thousands of gadgets from bumps, scratches, and dings with a lifetime guarantee. 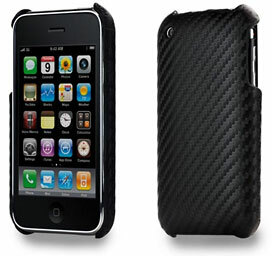 The InvisibleShield designs for Apple's iPhone and iPod lines are some of Zagg's most popular products. protecting & enhancing the iPad. Historically, Zagg's accessories have sold well for Apple products, said Derek Smith, Vice President of Sales of Zagg. The InvisibleShield our flagship accessory will allow iPad users to protect their tablet computer without compromising the operation or appearance of the device. 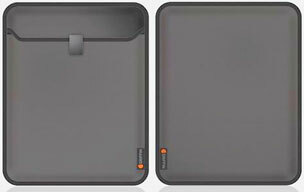 The InvisibleShield for the iPad is available as a preorder on Zagg.com. The InvisibleShield will be ideal for protecting and enhancing the iPad, said Robert G. Pedersen II, CEO and cofounder of Zagg. 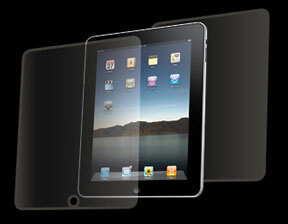 We expect the iPad to be another successful product for Apple, and our InvisibleShield is the perfect complement. PR: The new Apple iPad was announced Wednesday at the usual location, the Yerba Buena Center for the Arts in San Francisco, and after months of rumours, speculation and anticipation, the new iPad looks to be yet another stunning creation from our friends at Apple. Boasting a 9.7" LED backlit glossy widescreen, two different models will be available, WiFi and 3G, shipping at the end of March and end of April respectively. So far Proporta has a couple of perfect accessories to keep this beauty out of harms way. So far Proporta has a couple of perfect accessories to keep this beauty out of harms way. 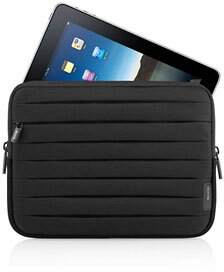 First up, the Perfora Leather Style Netbook Case (Apple iPad). Thanks to its robust faux leather protection and luxury lining, this protective iPad case is guaranteed to envelope your iPad in the style it deserves. Available in black, red or green, the handcrafted faux-leather exterior guards against everyday damage, scratches and knocks, and the contrast stripe and perforation detail design means that it cuts quite a dash in the process. As an added extra, there are slots for storing your spare memory cards inside. Also available from Proporta is the Maya Leather Style Netbook Case (Apple iPad), ideal for housing your Apple iPad and keeping it safe from everyday knocks and bumps. The contrast white and grey diagonal stripes offer a stylish finish to this accessory and keep your iPad (and you) looking super stylish. The new formfitting Crystal Case and sleek Mizu Shell for your Apple iPad. 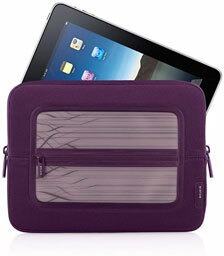 Designed exclusively for the Apple iPad and available in a variety of colour styles to suit. If you're interested in receiving notification about both these accessories (and any more Proporta have up their sleeves), please click on Website to register your interest. Proporta will be exhibiting at this year's Distree XXL from the 8th-11th of February in Monte Carlo, the millionaire-s playground. Even the rich and famous need to look after their gadgets. PR: Belkin presents three new sleeves-Vue, Max, and Grip-to protect your new Apple iPad while you're on the move. These 10" sleeves are designed with reinforced panels to fully protect your device's touch screen from scratches, while still offering storage for other media devices such as an iPhone, media reader, or earbuds. The iPad user is one who is moving from place to place, so we've designed our cases to protect the device from this movement and activity. People will be using their iPad often to get online, so they'll need easy access to them and, similarly, they'll need their case to be gripable but also protective. The textured surface of the Grip Sleeve gives you a stronger grip on your iPad to prevent drops. Because iPad users aim to be always connected, they tend to carry additional gadgets-such as a smartphone-that need to be stored. The Vue Sleeve features a windowed pocket that lets you easily find your accessories as well as store them. The Max Sleeve's unique pleated design expands to accommodate all your accessories. It also collapses flat when storage is not needed for a slim profile, able to fit into a larger bag. From our consumer insight research, we're learning that people want to be able to connect to the world-their friends,family, the Internet-at any given point in time, whether at the doctor's office, waiting in line at the grocery store, or even in a caf. The new iPad unlocks the opportunity for these always-connected people, allowing them to read books, play games, watch movies, send emails, listen to music, browse the Internet, and much more. Belkin's new Vue, Max, and Grip Sleeves not only protect your iPad, but give you instant access to it as well as your other accessories. Whether you re traveling around the world or down the street, the Vue Sleeve has you covered. The expandable see-through pocket lets you keep track of your essentials with visibility and surprising capacity. The unique design features embossed patterns and colors to express your sense of style and offers a sleek storage solution for your personal items, flash drive and more. Easily slips inside another bag so you can take your iPad anywhere. Made of lightweight durable neoprene, the Vue Sleeve protects your device, and the soft quilted lining offers an extra layer of protection. There's also an additional reinforced panel to further protect your device screen. Stash it all on the go. The Max Sleeve's unique pleated design expands to fit your iPad and all your accessories like your charger or iPod with a compact shape slim enough to slip into a another bag. You ll be surprised at the capacity. When you don't need it, it collapses flat again for easy storage. It's the all-in-one solution for carrying your device and everything else you need. Made of lightweight durable neoprene, the Max Sleeve protects your iPad, and the soft quilted lining offers an extra layer of protection. There's also an additional reinforced panel to further protect your device screen. If you want more than just a basic sleeve, grab hold of this. The Grip Sleeve's textured surface gives you a firm hold on your device, and the laser-etched silicone is a stand-out in unique colors and patterns for just the right style. Made of lightweight durable neoprene and silicone, the Grip Sleeve's unique layering of materials gives you enhanced protection from scratches and dings. There's also an additional reinforced panel to further protect your device screen. Get back to basics with scout - one click of the heavy duty buckle gives you access to the laptop section (with a secure flap), your documents and folders, utility pockets for accessories, and a secure zippered pocket for a wallet, mobile, or iPod. Water resistant, light weight canvas gives scout a rugged look and feel and STM's new shoulder padding gives a comfortable carrying experience, even when the bag is full to the brim.Scout's laptop section is made from high density padding and cushioned felt lining, so your laptop is as secure inside the bag as you are wearing it. Scout comes in an x.small, small, and medium size and fits most 10.2", 13", & 15" screens. 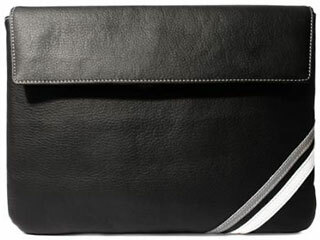 Micro is a light weight, slim line bag, custom tailored to fit netbooks up to 10.2". The protective laptop section uses a combination of high density padding and rigid board to keep your netbook safe from the outside world. 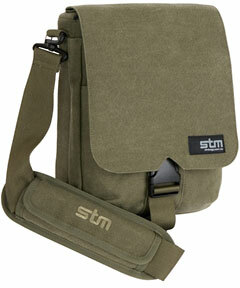 The comfortable, padded handles tuck away out of sight when you use micro as a shoulder bag. There's also space for adaptors and accessories. Micro can also be used as a travel bag. 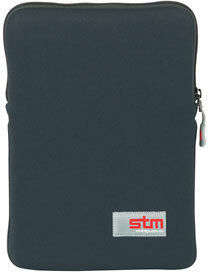 Your wallet, passport and other necessities can be quickly accessed while your larger items are protected inside an STM backpack. laptop space 27 x 19.2 x 3.5cm/10.6 x 7.6 x 1.4"
external bag 28.5 x 21 x 4cm/11.2 x 8.3 x 1.6"
Protect your iPad or netbook with STM's x.small glove - a slim fitting sleeve that shields the laptop from bumps, dust, and scratches. X.small Glove is made from hard wearing neoprene, and has a YKK zipper. Fits most netbooks with screens up to 10.2". fits most netbooks with screens up to 10.2"
When the going gets tough for your iPad, all you need is a FlexGrip. Griffin's FlexGrip case wraps your iPad in durable silicone that's easy to grip and protects against dirt, dings, dents and scratches. Fits snug around your tablet, and allows complete access to the audio output jack, dock connector, MultiTouch display and all controls. Travel in style with Elan Passport, no matter where you're headed. Elan folio flips open to reveal the Multi-Touch display, then closes like a book for privacy and protection, Elan Passport's microsuede lining protects your iPad from scratches and smudges. 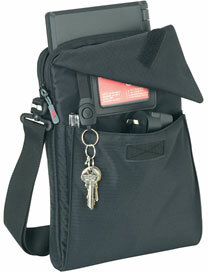 Held shut by a tab closure, inner cover includes pockets for ID and more. You're going to take your iPad everywhere. You need the case that's ready for just about anything. Tough in a good way. Slim enough to slip into a backpack, bag or briefcase, tough enough to protect your iPad from whatever it may find in there. 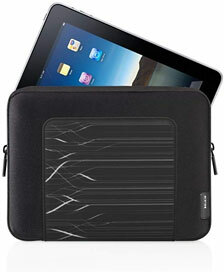 Slip your iPad into Elan Sleeve then flip the tab closure down to secure it. Then gently pull the tab to slide your iPad out quickly and safely. Stain-resistant synthetic outer shell with smooth micro suede interior. Your iPad, ready for anything. Soft, stretchy protection for your iPad. 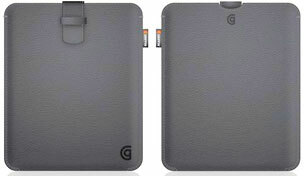 Jumper is Griffin's tough neoprene sleeve, designed to protect your iPad from dust, dirt, scrathes and fingerprints. Integrated pull tab tucks closed for 100 percent coverage. Slim enough to slip into a backpack, bag or briefcase, tough enough to protect your iPad from just about anything it might find in there.